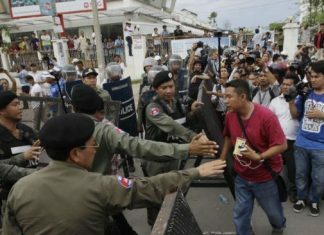 Cambodia’s most influential newsman, or at least the man whose stories reach the widest audience, decided on July 25 that his television stations did not have air time for one of the biggest news events of the year, the massive funeral procession for Kem Ley, a respected political analyst and constant thorn in the government’s side whose murder many believe was a state-sponsored hit. “We missed the march because we didn’t have time to air the event because the TV stations were busy with concerts and boxing,” Huy Vannak, the head of news for Cambodian Television Network (CTN) and its sister station Cambodian News Channel, said in the hours after hundreds of thousands lined the streets in mourning for the 46-year-old analyst. Overseeing news programs that run a steady diet of tabloid television—crime, car crashes and celebrities—Mr. Vannak, 38, also makes sure there is plenty of time to cover government events, business launches and notable acts of charity, often by prominent businessmen and government officials. A pagoda boy who did well in school, Mr. Vannak earned a master’s degree in global affairs from Rutgers University in New Jersey, and began his career in media at Radio Free Asia. A rising star within the ruling party, he was appointed in April as an undersecretary of state at the Interior Ministry and is a central committee member of the Union of Youth Federations of Cambodia, the ruling party’s youth wing, headed by Prime Minister Hun Sen’s son. His abilities as a politician are plentiful—dapper, diplomatic, smart and a master of spin. Asked how he might apply his positive worldview to an article about the military surrounding the opposition party’s headquarters in late August with helicopters, navy boats and trucks carrying masked and heavily armed soldiers—in response, many believed, to the CNRP threatening mass demonstrations—Mr. Vannak didn’t hesitate. Mr. Vannak was not alone in deciding not to cover Kem Ley’s funeral procession—the event was effectively blacked out on all local television stations. Nonetheless, he took great exception to The Cambodia Daily’s article quoting him about it, noting that his stations had covered Kem Ley’s murder and would continue to follow the trial of his alleged killer. In a text message to the Daily, he said journalists the world over had the right to decide what to cover. The main issue plaguing Cambodia’s media outlets, according to Mr. Vannak, is not a lack of independence or journalists being on the take, but rather a lack of quality. His plan to fix the problem is built around the Union of Journalist Federations of Cambodia, an organization that began a few months ago with its headquarters in a light blue building a few blocks from Independence Monument in central Phnom Penh. The funding for the project has come largely from senior government officials and CPP-friendly businessmen, with smaller contributions from members working for various media organizations. The first floor of the two-story building is mostly taken up by the News Coffee, a cafe that is meant to help support the union—as well as a Wing mobile money transfer kiosk with the same purpose. Upstairs is an open area with a couch and ping-pong table, a place for journalists to hang out and relax, Mr. Vannak said. Off to the side of the main room is Mr. Vannak’s office, which has a desk and a long conference table for meetings of the union’s founding members, mostly editors and executives of prominent Khmer-language media outlets. Mr. Vannak said the union already has some 800 members from outlets spanning the industry, from old media such as newspapers, radio and TV to upstarts such as social media pages and smartphone apps. The founding members include Lim Cheavutha, the CEO of Fresh News, a popular website that reports government news so fast and unfiltered that a reader gets the sense they are working together; Ath Bonny, founding editor of the National Police Newspaper, an enterprise that serves as both a platform for messages from senior police officials and reporting straight from crime fighters; directors of almost all the government-aligned television stations, which is to say all of the local television stations; and heads of the state-run media outlets. The group also includes Cheang Sokha, executive editor of the Khmer Times, and Vong Sokheng, deputy news editor at The Phnom Penh Post. Cambodia Daily journalists were not invited to join the union, though Mr. Vannak said they were welcome to take part in its activities. 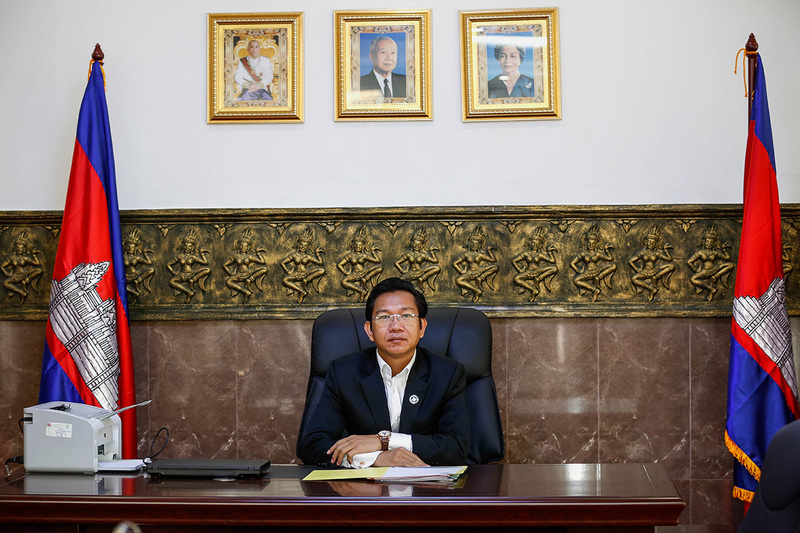 The walls of the upstairs rooms are lined with framed photographs of Mr. Vannak posing with various government ministers, including Prime Minister Hun Sen. In one photograph, Mr. Vannak is seated at a UJFC fundraising event along with Foreign Affairs Minister Prak Sokhonn, Tourism Minister Thong Khon, Information Minister Khieu Kanharith, and Hong Piv, a real estate tycoon who has made generous donations to Mr. Vannak’s cause. Asked about whether journalists could be expected to maintain their own independence as members of an organization funded and run by government officials, Mr. Vannak said the question was misguided. Kok Thay Eng was hired to run the union’s day-to-day operations as head of the UJFC secretariat. Before taking the job, he worked for a decade at the Documentation Center of Cambodia, which holds the largest Khmer Rouge archives in the world, and uses them as part of unceasing efforts to educate Cambodians about their history. They were working as young researchers at the center when Mr. Eng and Mr. Vannak met—Mr. Eng also studied at Rutgers, returning to Cambodia with a doctorate in global affairs. Mr. Eng, 36, is still working on a personal project to collect the names of the estimated 1.7 million people who died under the Khmer Rouge—along with their age, gender, and cause and location of their deaths. He has 20,000 recorded so far. With the journalists union, he said, he was ready for a new challenge, and felt there was much to improve in the local media industry. In contrast to Mr. Vannak, Mr. Eng said that independence was a key element of journalism, but that he could not think of a media outlet in the country—in Khmer or English—that managed to find middle ground, particularly when it came to political coverage. 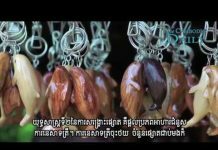 “Khmer language outlets, I don’t think there is one, including on the radio. English language outlets, I think they are too biased. In Cambodia, I think they are a bit biased toward one side and not the other. They are biased toward the opposition. They are more biased toward that, whether they say it or not. They speak more on behalf of the opposition. If there is something bad about Cambodia, then they talk bad,” he said. Mr. Eng said the union did not expect to be able to change ingrained practices of corruption in journalism—people paying to place stories or to keep stories out of the news—or the self-censorship practiced by many mainstream media outlets. “It has been there, in terms of what you discuss, what’s allowed to report and constraints around reporting about particular topics has been there in Cambodia already, you know, and everybody knows. I don’t think it comes from UJFC, or what we have been doing will create that. It has been there already. It will continue whether it has us or not,” he said. As Mr. Eng showed reporters around the upstairs of the union’s building—surrounded by a veritable collage of Mr. Vannak and fellow ruling party power brokers—he insisted politics was not part of the plan. Ouk Kimseng, spokesman for the Information Ministry, said this week that it was still too soon to say whether Mr. Vannak and his union will succeed in its mission to improve the quality of journalism in the country. But he said there was no issue with a fellow government official leading the drive. “I don’t want to be too early to evaluate what to expect. But I hope these people, with their skills of professionalism in journalism, can help journalism in Cambodia to improve or to comply with what we call the current development of democracy practice in this kingdom,” he said. Mr. Kimseng lamented the tendency among some to dismiss government-led projects as being politically motivated. “In Cambodia, if you criticize the government you will be seen by the other group of people as independent. But if you are in support of the government, people will point at you and say you are pro-government. So what? So this is the decision they take and wherever they go, this is their right,” he said. Both Mr. Vannak and Mr. Eng stressed during interviews that all journalist were welcome to take part in workshops or training put on by the union. However, the lineup of journalists selected to start the union is notably absent of representatives from media outlets that are particularly unpopular with the government, noted Sun Narin, the founder of the startup news site The Phnom Penh Today and former news editor for Voice of Democracy (VOD). Despite their facilities and funding, Mr. Narin said he was dubious that the group could improve the quality of journalism, if that meant teaching members how to report critically and in-depth, even when stories touched on sensitive topics involving powerful people.